Why do we baptize? First, we baptize because God commanded it. Shortly after his death and resurrection, Jesus said to his followers, “Go and make disciples of all nations, baptizing them in the name of the Father and of the Son and of the Holy Spirit” (Matthew 28:19). Ever since, the church has been baptizing people of all ages. What a mess! The miracle of grace is that God still loves us and sent Jesus to rescue us from our natural condition. He paid for all our sins. Then Jesus instituted Baptism as God’s way of handing over to each one of us individually all the blessings he won on the cross. Therefore the age of the recipient makes little difference, because baptism is God’s work. We are not making a commitment to God; He is making a commitment to us. We are not dedicating a child to God; He is dedicating himself to a child. Therefore, it is in infant baptism that grace is proclaimed the loudest in the church, for an infant has done nothing to earn or deserve God’s favor. An infant shows what real faith means: to be in the presence of a Holy God with nothing to offer . . . with empty hands, totally dependent on him. Finally, it’s important to note that baptism is not magic. God gives us the freedom to reject it, dismiss it, and not believe in him or his gifts. And where there is no faith, there is no salvation (Mark 16:17). But where there is baptism and faith, there is the promise of salvation, as these words of Jesus declare: “He who believes and is baptized shall be saved” (Mark 16:16). Therefore baptism is always to be followed up with instruction in the Christian faith, beginning even when the child is very young. If you would like more information about Holy Baptism (e.g. 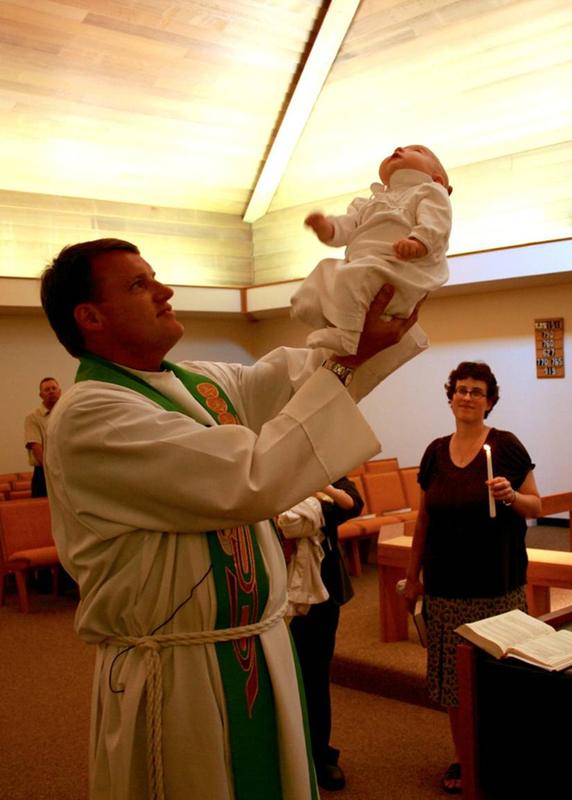 why we baptize infants, what the God-parents are really promising, etc.) please click here: FAQ. If you would like to consult with the pastor regarding the baptism of your child, please call the church office. It is preferred that at least one parent is a member of Good Shepherd. If neither parent is a member, it is important that they at least support the child in his/her ongoing instruction and nurture in the Christian faith. Baptism dates are scheduled through the Church Office (920-261-2570). Adult Baptisms for those who have never been baptized normally take place following instruction in the Christian faith. Baptisms are usually held within the worship service because the congregation, on behalf of the whole church, is also assuming responsibility for nurturing the baptized child in the Christian faith and life.